Dentures are a great solution for patients who are missing all or most of their teeth. Comprised of artificial teeth that are attached to a gum-colored plate, dentures offer a second chance for a beautiful smile and good oral health. Cobblestone Park Family Dental believes everyone deserves an attractive and functional smile. We utilize only the highest quality materials to craft dentures and customize the prosthetics to fit seamlessly into every unique mouth. 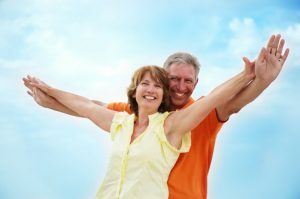 If you would like to learn more about dentures, contact our Oklahoma City dental office or continue reading below. Dentures offer a multitude of benefits for patients with missing teeth. With dentures, chewing and speaking become easy and comfortable again. A full set of teeth also supports the facial muscles and prevents them from sagging. 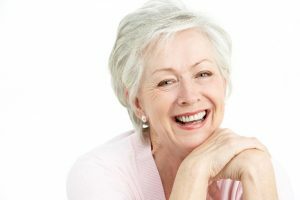 With dentures, you can look younger and smile confidently again. There are two types of dentures: partial and full. Partial dentures are designed to only replace some teeth. It consists of replacement teeth attached to an acrylic base that matches the color of the gums. Partial dentures have a special clasp that is used to fasten to the teeth surrounding the space. Full dentures replace all of the teeth on the lower arch, upper arch or both. Like partial dentures, full dentures consist of artificial teeth attached to an acrylic base that shares visual characteristics with the gum tissue. Dentures can be removable or fixed into place. Removable dentures are secured into place using a strong adhesive. Fixed dentures use several titanium posts surgically inserted into the jaw to secure the dentures into place. Implant-fixed dentures can only be removed by a dentist. Your dentures will be customized to your unique specifications and personal preferences. Dentures can be made using different materials. Rest assured your denture appliance will be strong, natural-looking and aesthetically pleasing. Depending on your case, our dentists may need to extract a few remaining teeth before fitting and placing your dentures. We may place an immediate and temporary denture so you can chew and speak while your mouth heals and your permanent dentures are made. To create your dentures, we will take measurements and impressions of your teeth and mouth. This information will be sent to a dental laboratory where your dentures will be fabricated. Once your prosthetics are ready, you will return to our office so we can place them. We will direct you on how to place and secure the dentures in your mouth and have you practice chewing and biting. We will make any last-minute adjustments to your dentures as needed. If you are having implant-fixed dentures placed, we will first surgically insert several implant posts into your jawbone. The jawbone will be allowed to naturally heal before we place your permanent dentures. To find out if partial or full dentures are right for you, schedule a consultation with Cobblestone Park Family Dental. Contact our Oklahoma City dental practice by calling (405) 603-8520 today.